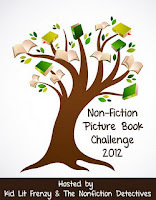 We've partnered with Allyson at Kid Lit Frenzy to encourage readers to read more nonfiction picture books this year, and here's a book to add to your list. Birds are a popular topic in my school library. Children check out many bird books in both the 500s (science) and in the 600s (pets). Lita Judge's recent nonfiction picture book, Bird Talk: What Birds Are Saying and Why, is going to be a hit with the readers in my library. 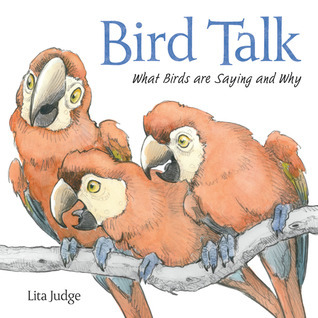 Bird Talk isn't your typical bird book. Instead of photographs, the book is brimming with colorful watercolor and pencil illustrations of dozens of species of birds including the Rhinoceros Hornbill, Blue-Footed Booby and Scarlet Macaw. The book examines how and why bird communication. Readers will learn how birds use calls and physical features to attract mates. Children will giggle at the illustration of the Sage Grouse with its chest puffed out as he tries to gain the attention of a female grouse. Birds also communicate to help their young stay safe and to warn of danger. When a fox stalks near the nest of a North American Killdeer, Mama screams and flaps a wing awkwardly. Her broken-wing trick says, "Follow me, I'm injured, I'm a better meal." She stays just out of reach, luring the fox away from her eggs. The design of the book is perfect for young readers. There is ample white space, and the text is chunked so newly independent readers will not be overwhelmed. It also is the perfect length for a read aloud in a library or classroom setting. An illustrated list of birds featured in the book is located in the back; each entry includes the habitat, range, and interesting facts. This is not a book for students who are researching birds and need in-depth information about a particular species. 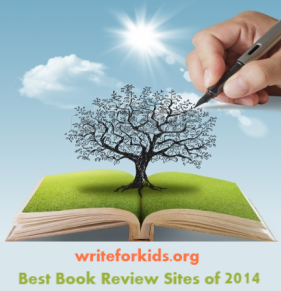 It's a book that could serve as a springboard for readers who enjoy learning about science and nature. Pair this book with Thunder Birds: Nature's Flying Predators by Jim Arnosky.